Since the publication of Amelia Earhart: The Truth at Last, I’ve developed an Earhart Truth Presentation that I can perform with power point or normal visuals. The below content is taken from a sample flyer that I’ve sent to various groups in the North Florida area. ACTIVITY DIRECTORS: TREAT YOUR SENIORS TO A RARE EXPERIENCE: LEGENDARY FLYER AMELIA EARHART’S TRUE FATE REVEALED! MANY OF YOUR SENIORS CAN REMEMBER SITTING BY THEIR RADIOS WITH THEIR FAMILIES IN JULY 1937, ANXIOUSLY WAITING AND HOPING IN VAIN FOR WORD THAT AMELIA HAD BEEN FOUND. – Where Amelia Earhart and Fred Noonan landed after they went missing. – How and where the ill-fated flyers met their tragic, untimely deaths. – Why the U.S. government and media continue to suppress the truth. – The propaganda, myths and lies the establishment continues to feed the public. – Eyewitness testimony from many unimpeachable sources, and much more! I’m a Navy veteran and have told the stories of countless Sailors, Marines and Airmen during a 30-year career. For the past 30 years I’ve also been researching, interviewing witnesses, locating documents, writing and seeking the truth in the so-called Amelia Earhart “mystery.” My two books, With Our Own Eyes: Eyewitnesses to the Final Days of Amelia Earhart and Amelia Earhart: The Truth at Last, are among the most comprehensive ever penned about the Earhart case. 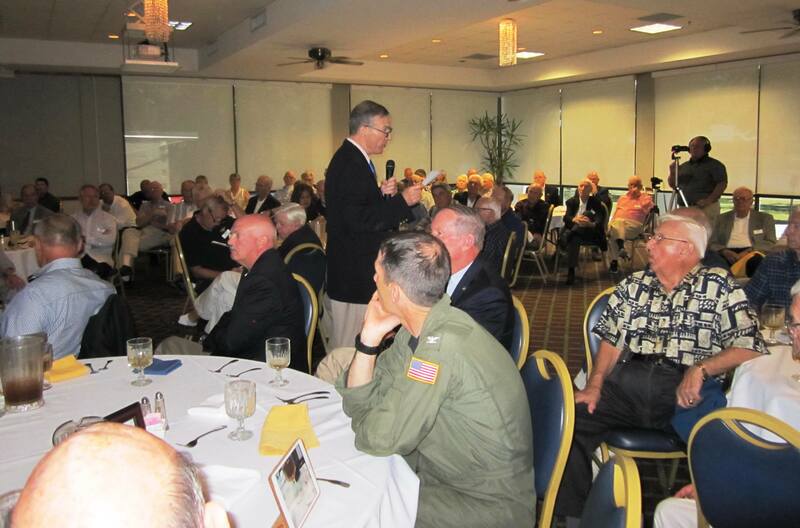 I’ve done several programs for seniors and other groups in Jacksonville, and in September 2014 in Wichita, Kansas, I presented a two-hour power point program to the South Sectional Meeting of the Ninety-Nines, the elite, 5,000-plus-member women pilot’s group co-founded by Amelia Earhart herself in 1929. If you have a computer and screen in your facility, I can do a similar show that accommodates your time and informational needs. I also have plenty of glossy photos and other visuals that I use to do a regular standup presentation hat will make their experience equally enlightening. The important thing is that they will be hearing the TRUTH at least once in their lifetimes. “This reviewer has covered most of the voluminous output on America’s greatest heroine, but nothing comes close to this, the most exciting and scholarly read since the late Thomas E Devine’s compelling Eyewitness: The Amelia Earhart Incident. Clearly, Mike Campbell is the leading authority on all things AE, and this book must now be considered the recognized masterclass and essential go to handbook on what really happened to Earhart and Noonan. Thanks to Mary Fletcher and Warren Brown of the Florida Aviation Historical Society, this great ad appeared in the Tampa Bay Times in February 2016 in advance of my presentation at the St. Petersburg Museum of History. “The author’s brilliant grasp of his subject is truly astonishing, and the sheer depth of his research is a marathon achievement. … The truth is there to be had — right here, right now – in the revealing pages of Mike Campbell’s incredible book.” – Roger Hopkins, United Kingdom, Amazon.co.uk reviewer. 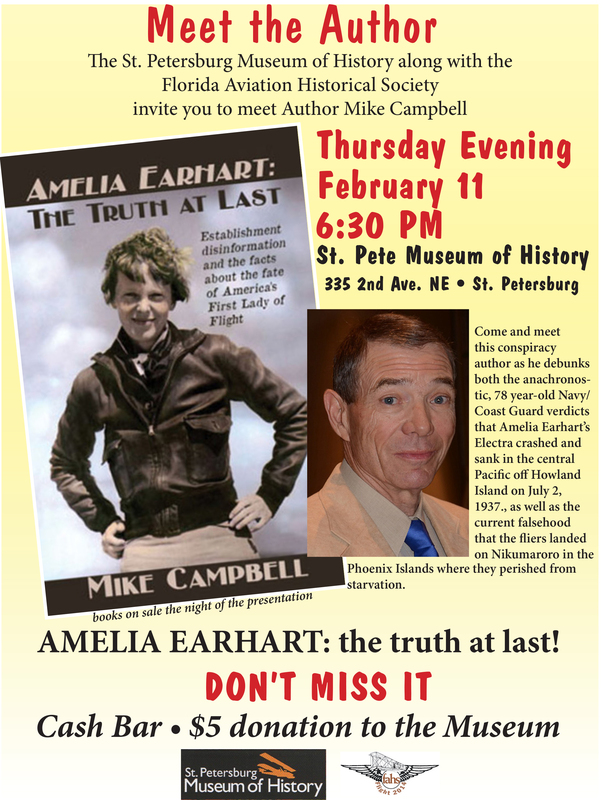 “No one has ever written more comprehensively on the subject of Amelia Earhart’s disappearance than Mike Campbell, and no one is more trustworthy on the subject. That last point is not a small one, because the Earhart mystery continues to be a hot topic, and there are still an ample number of shills for the government who would lead you astray. 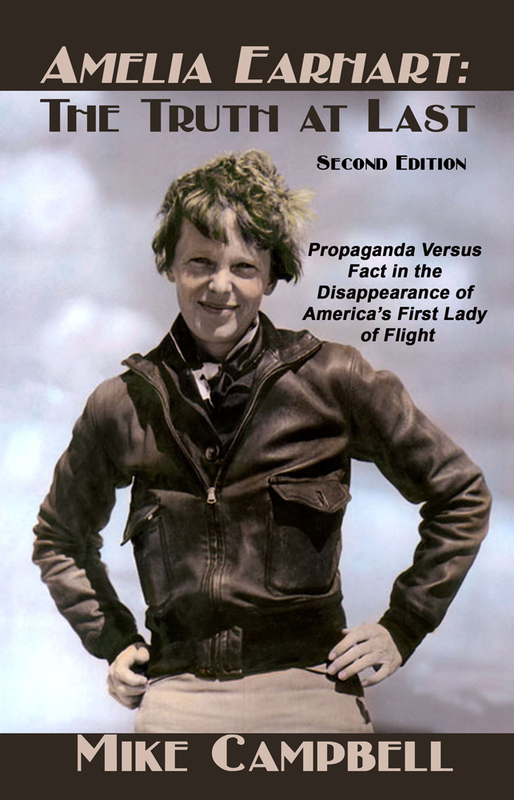 “The very best evidence that Campbell is the man to be trusted on this subject is the fact that, as of the date of this writing, both this book and the earlier book that Campbell wrote with Thomas E. Devine, With Our Own Eyes: Eyewitnesses to the Final Days of Amelia Earhart are blacked out at the very large Amelia Earhart Wikipedia page. “In a nutshell, what Campbell has given us is an absolute cornucopia of forbidden truth. Read it and you will know far more than [most] know in 21st century America.” – Amazon.com review by David Martin, Dec. 22, 2014. (See also Martin’s “Hillary Clinton and the Amelia Earhart Cover-up,” from Veterans News Now. “Your presentation was wonderful!” – Dianne Jimerson, Life Enrichment Coordinator, The Windsor (Assisted Living and Memory Care), Jacksonville, Fla.
“Your presentation on Amelia Earhart was extremely well done, with excellent pictures and narrative. It gave the audience a deeper understanding of what transpired and the strong possibility that she survived the flight, only to be executed in the end by the Japanese on the island of Saipan. I live in North Jacksonville, and would like to speak to your group to share my passion, knowledge and experience so that they might learn the truth that’s been withheld from them for so long. I ask only a small, negotiable speaking fee to cover expenses, and that you allow me to offer your seniors signed and discounted copies of Amelia Earhart: The Truth at Last. Please don’t let this opportunity pass your seniors by. Ask them today if they’re interested in learning the truth about what really happened, and contact me to arrange a memorable experience your members will enjoy and thank you for! You can contact me at mbcampbell29@aol.com. Hi Mike, I enjoyed reading your blog this morning. A smile and a fond memory for me to hear of your invitation to speak to the Ninety-Nines in Kansas. My invitation many years ago, 1984, I replaced Ann Pellegreno who was unavailable to speak and recommended me to Amy. It was a thrill, indeed, and an honor, Sally Ride was in the audience! Be easy on those remarkable ladies, just as few want to believe the horror of what could have happen on Saipan to Amelia, the proteges of our heroine hold her dear in their hearts. It is sad, history is filled with unpleasant truths, there are few rules that are in waring times(even four years before the war!). My friend, ever so indirect, Adele Robgers St. Johns had a big sign over her typewriter: If History didm;t happen that way(the way we want to remember) It should have!” and “Story Tellers have good memories, and hope others do not!” Another memorabilia I say in one of my travels, “The soldiers win the wars and the Generals get all the credit!” We still have a strong cache of Soldiers for Amelia. I respect the work you’ve done with your Earhart research. It would have been so fun to have you as an active member of the beginning strong, positive movement of Amelia Earhart Research Consortium(AERC) we we were all communication together, willingly. Of course, AERC met with an unexpected, negative end and the divisions, possessiveness, and single minded devotees seemed to move backwards. You were probably not born in those days(daze?) Were you even born then? Thanks for your kind message and interesting comments. I was born in 1950, well before the AERC was formed, I would imagine. I think Amelia is managing this development. It’s the best explanation I have for the incredible “coincidence” of the KANSAS Chapter of the Ninety Nines inviting me to speak. I just found your blog by searching for the Amelia Earhart Society. I contacted Bill Prymack in April of 1996 and found a letter he wrote to me. I was good friends with T.C. “Buddy” Brennan whom wrote the book, Witness to the Execution. He lived not too far from me. Would love to help out in anyway I can. At one time he had a stack of all the documents from Congress regarding the AE research that was done. And before he passed he wanted me to continue the work and thats something I’d like to pick back up. If you get the chance, e-mail me. Would love to read your book. The Japanese military were, indeed, intercepting radio transmissions. They also had the ability to statically interfere and were doing so for a while, in order to block communications and confuse travelers through the area. That’s interesting, Judy, because none of the radio experts who have analyzed the Earhart disappearance have suggested that the Japanese could have “interfered” with her transmissions during the final flight. Sure we often hear that they could have “tracked her” with their HF/DF assets, but not actually interfere with her radio comms. Please let us know where you got this idea. Thanks! There is quite a bit of data on it. I became familiar with radio intercept in Europe during the 70’s and out of interest, pulled the string back to Japanese/Nazi collaboration on those islands in the late 20’s/early 30’s. It had to do with electronic experimentation, both radio waves and on their prisoners in a medical setting. Ohmmeters were used as well. Casual references are in various publications but nothing saying, “Oh! Look!”, due to the environment of that area and time period, as we all know. I’ll see if I can locate them. It’s been many years. I can’t find a post that’s dated March 11, 2014. Please check the date and get back to me. There is indeed another Earhart book in the works, but I’m not the author. For now I don’t want to say any more about it, but it promises to be very good. Does Earhart Society accept newsletter submissions. If so, what are the submission writing rules? The Amelia Earhart Society Newsletter was discontinued by Bill Prymak in 2000. For all intents and purposes, there is no longer an Amelia Earhart Society, though their online forum, the Yahoo! Earhart Group is still functioning, with scant little participation, and is all but defunct. If you have something you would like published, I would be glad to consider it for this blog. It’s about as close as you’re going to get to the AES, and it will be seen by those who understand and appreciate the truth about the Earhart disappearance. I am just about to sit down to read your book…I am fascinated with good evidence on any “conventional truth” being wrong so this should be a great read. I just have one question that I hope you will respond to. Why do the authorities go to such length even 80 years later to suppress this story? After so much time it doesn’t appear to me to make much sense.